Tommy Orange did not grow up around books or aspire to be a writer. 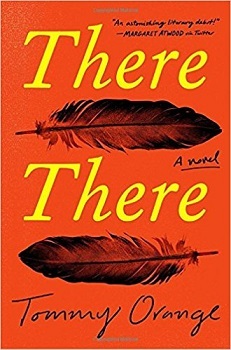 A recent graduate from the MFA program at the Institute of American Indian Arts, this debut novelist who came to writing late in life is making quite a splash with his first book, There There, a polyphonic story of 12 Urban Indians whose worlds collide at the Big Oakland Powwow. Orange grew up in Oakland and clearly is writing about his home turf. A powerful prologue frames There There as an ode to Urban Indians who “know the downtown Oakland skyline better than any sacred mountain range, the redwoods in the Oakland hills better than any other deep wild forest.” Giving voice to the 70 percent of Native people who live in cities, among other things, Orange refutes the stereotype of the historical Indian. In alternating chapters, we learn the backstory of each of the 12 first-person characters, some related, some whose lives intersect only briefly before their collision of fates at the powwow. Orvil Red Feather knew he wanted to learn traditional dance the first time he saw Native dancers on TV (in an ironic aside, the narrator points out that it was in November, a time when it is easy to find Indians on TV). It awakened a hunger in him to be part of “something you could dance to.” Finding some dance regalia that more-or-less fit him in his mom’s closet, Orvil taught himself to dance by watching YouTube videos. Now he is going to the Oakland Powwow (he only knows about powwows from the internet) to dance in front of others for the first time. Orvil’s grandmother, Jacquie Red Feather, is also heading to the powwow, excited to meet Orvil and his two brothers, her grandsons, for the first time. She has been estranged from her daughter, Blue, who is herself estranged from the three boys who are being raised by their great aunt. Jacquie is a substance abuse counselor and recently sober alcoholic. Other characters include Tony Loneman, born with Fetal Alcohol Syndrome (which he calls “the Drome”), and Dene Oxendene, an aspiring young artist who is setting up a booth at the powwow to video document stories of Oakland Indians. Edwin Black is half-white, overweight, addicted to the internet, and searching Facebook for the father he has never met. And Octavio Gomez plans to rob the powwow of prize money, even figuring out how to 3D print guns out of plastic so he can get them through the security gates. This landscape is rife with fractured families, violence, suicide and drug abuse; destructive cycles are faithfully portrayed in There There. It is also a birthplace of hope and cultivator of resilience, as characters take steps to create themselves anew. There There is already on many “best books of 2018” lists and is being described as stunning, devastating, masterful, ferociously honest, and destined to become required reading. You’ll want to add this debut to your summer reading list. Lisa Gresham is the Collection Services Manager for Whatcom County Library System.